Enjoy a little taste of the Caribbean at your table with this quick and easy Sweet Fried Plantains recipe. With crispy outsides, and soft, creamy insides, these Sweet Fried Plantains, also known as Platanos Maduros, are sure to become a favorite! The very first time I tried plantains, I was super disappointed! I’d heard countless times how delicious they were, but I just couldn’t see…ummm…taste it. Perhaps it was the way they were made. Or perhaps they were not as ripe as they should have been. Fast forward a couple of years – and to a different region, and I tried them once again. This time they were pan-fried plantains, and they were amazing! Fried plantains are absolutely delicious with their crispy outsides and soft, creamy insides. They can be enjoyed in a variety of ways at almost any time. 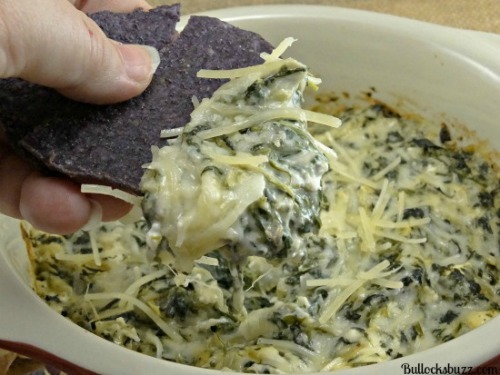 They make a great gluten free snack (be sure to check your oil), a scrumtious side dish, and even an amazing appetizer to dunk in chunky salsa and creamy dips. Not sure what plantains are? Commonly enjoyed in the Caribbean islands and Latin America, plantains look similar to bananas, although they’re a bit larger and firmer. They are actually part of the banana family, but that’s where the similarities end. Plantains can be eaten ripe or unripe; although unlike bananas, they are not good to eat raw. 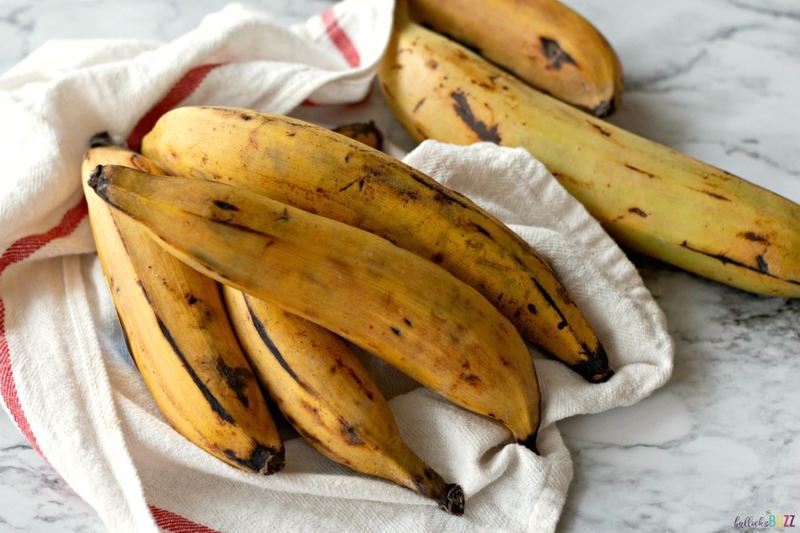 Packed full of vitamins, fiber and potassium, plantains are quite healthy. And they are versatile, as well!  How Can You Cook Plantains? Plantains can be baked or mashed, roasted (like these scrumptious Oven Roasted Red Potatoes) or fried! You can pair them with a salad, serve them with a protein and veggies, dip them in a bowl of New England Chili or enjoy them topped with homemade guacamole. 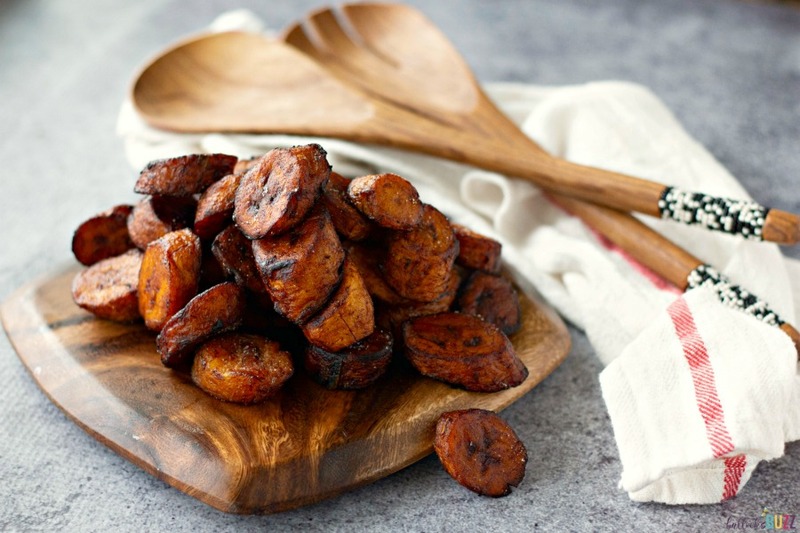 However you eat them, I definitely recommend you give this pan-fried sweet plantain recipe a try! 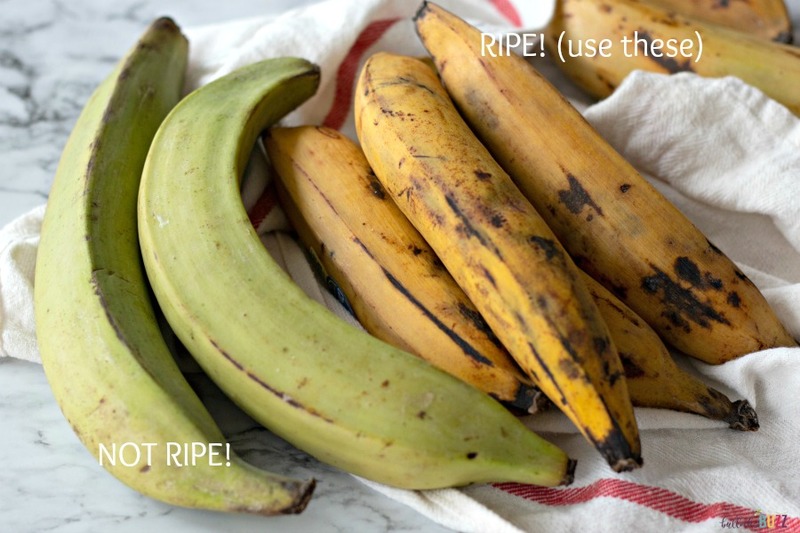 Picking the Perfect Plantain: How Ripe Should Plantains be for Frying? With this incredily easy fried plantains recipe, your plantains will turn out crispy on the inside and creamy on the inside. In fact, they’ll taste so good it’ll be hard not to eat them all by yourself! However, the key to making this recipe turn out amazing is using plantains that are at just the right stage of ripeness. Like bananas, plantains start out green in color and quite firm. As they ripen they slowly turn bright yellow, then a darker yellow with brown spots. Eventually they will become completely brown and mushy. And as they ripen, they also get sweeter. The riper the plantain, the sweeter it is. 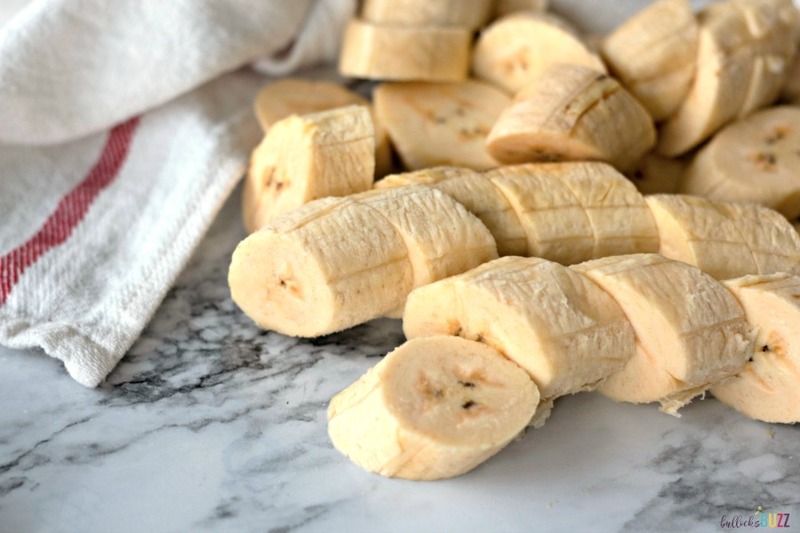 Because you want to use perfectly ripened plantains, you’ll need to do a bit of planning before making this recipe by purchasing the plantains in advance and then letting them ripen for several days. I find that it usually takes anywhere from a few days to a week or more for green plantains to ripen on the counter. You can help speed up the ripening process by placing the plantains in a brown paper bag with an apple. Close the bag loosely and set it in a warm area. Once the skin has plenty of brown spots and the plantains are moderately soft, they will fry up nice and sweet. 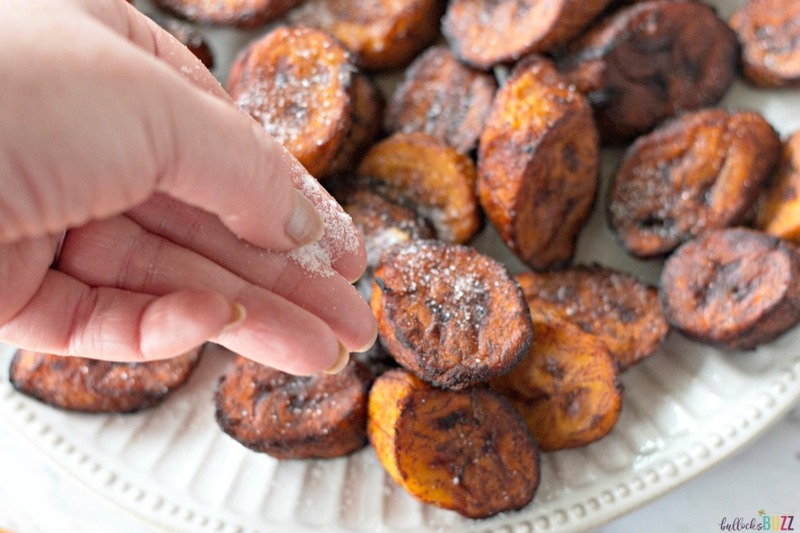 Making this sweet fried plantains recipe is super easy. 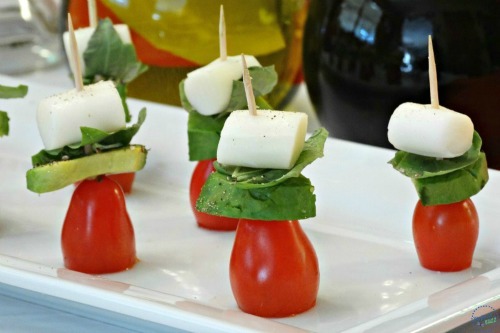 All you need is a few ingredients, some common cooking supplies and about 20 minutes. As is, this recipe will serve 6 people. First you will need to use a sharp knife to peel and slice the plantains. I’ve found that the easiest way to do this is to cut about a quarter inch (1/4″) off of each end, and then carefully, without cutting into the ‘meat’ of the plantain, slice the skin down one side. Once you have slit the skin on one side, you can then use your fingers to gently pry the skin off. Next, slice the peeled plantains diagonally into 1-inch thick pieces. Add the oil (about 1 ½ inches deep) to a large skillet or saute pan, and then heat it over medium-high heat until it reaches about 350° F. Test the oil for readiness by adding one piece of plantain. If the oil bubbles vigorously, then it is ready to go. 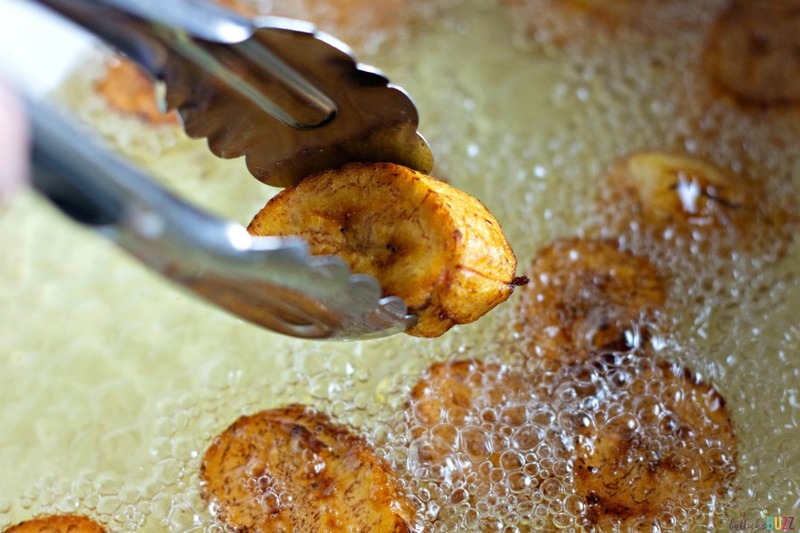 Fry the plantains in small batches until they are golden brown, turning once. Once finished, carefully remove the pieces from the oil with metal tongs or a slotted spoon. TIP: make sure you avoid overcooking the plantains. Remove them from the oil right when they start to turn golden brown. Don’t let them get black or burned. 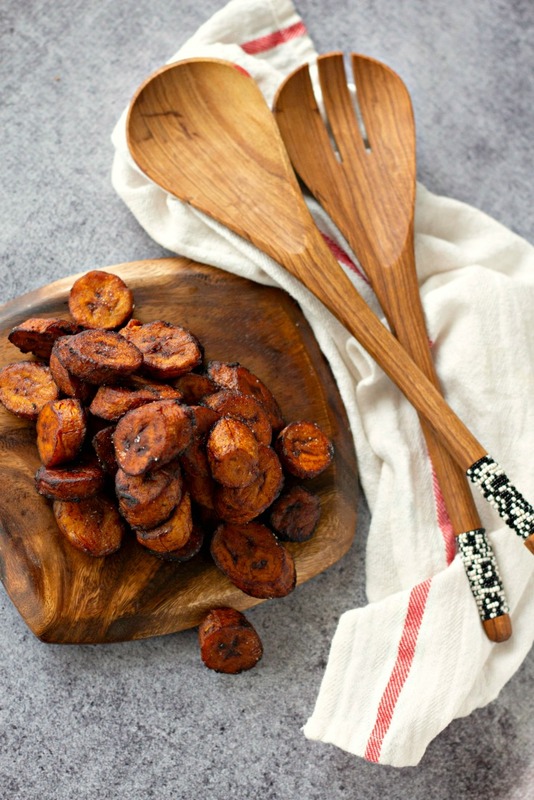 Allow the plantains to cool on a baking rack or plate. I personally would not use paper towels because the plantains may stick to them. Not yummy! Now you can make things a little sweeter by sprinkling the cooked plantains with sugar if so desired. Serve while they are still warm and enjoy! Don’t they look amazing?! if sugar isn’t your thing, try adding some a sprinkling of salt. or add some thinly-shredded cheese. Just be sure to sprinkle the cheese on the plantains as soon as you place them on the plate so they are still piping hot. The cheese will then melt over the plantains creating a sweet and savory treat everyone will love to eat. 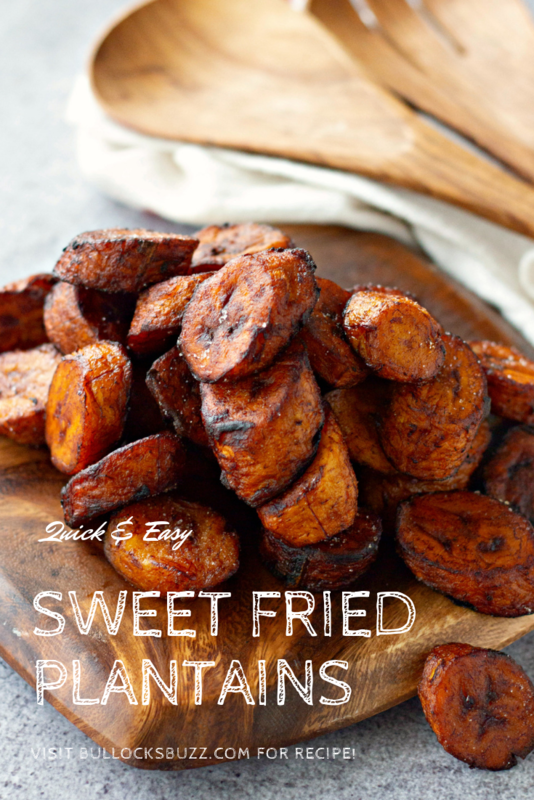 To make this easy fried plantains recipe even easier, here is the printable version of the recipe. Enjoy a little taste of the Caribbean at your table with this quick and easy Sweet Fried Plantains recipe. With crispy outsides, and soft, creamy insides, these Sweet Fried Plantains, are sure to become a favorite. 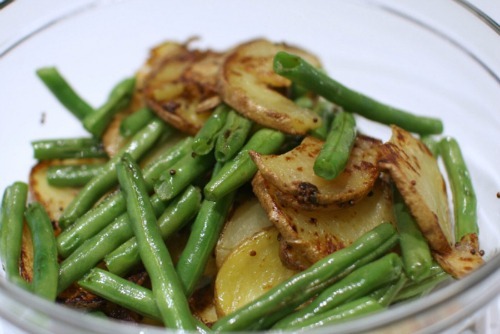 Eat them for breakfast, as an appetizer, a side dish or snack. Using a sharp knife, cut off the ends of the plantains. Next, cut a slit down the side of the plantain and use your fingers to peel off the skin. 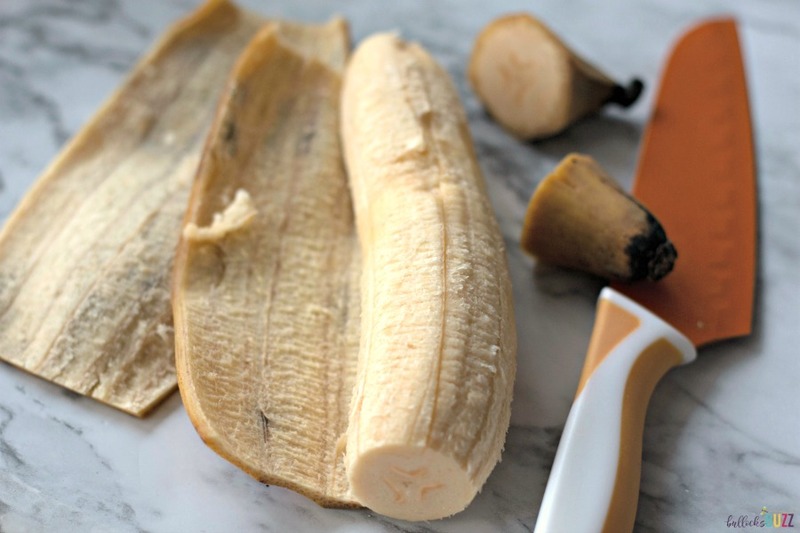 Slice the peeled plantains diagonally into 1 inch thick pieces. 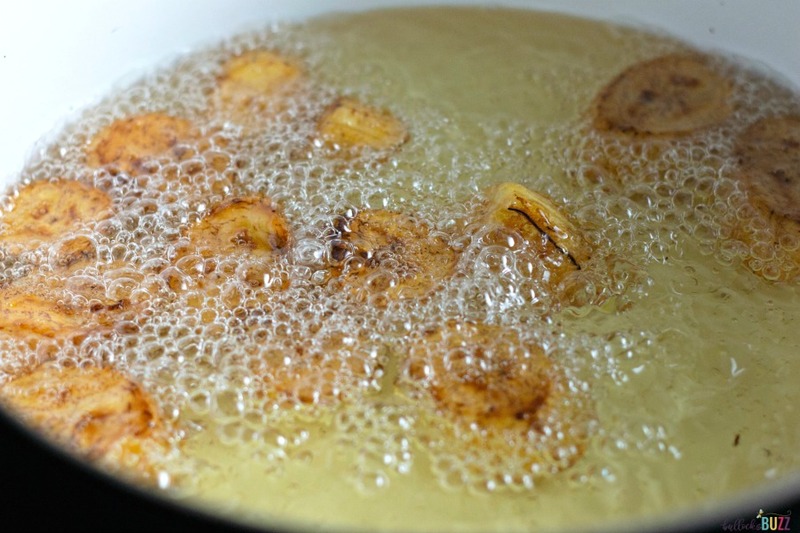 Add oil to a large skillet (enough to cover plantains about to 1 ½ inches deep), then heat over medium-high to about 350 degrees F. Test the oil by adding one piece of plantain: if the oil bubbles vigorously, it's ready. Fry the plantains in small batches until golden brown, turning once. Then remove from the oil with a metal slotted spoon or tongs. Place on a cooling rack or plate. Do not use paper towels as the plantains may stick to them. Sprinkle with a little sugar if desired. Serve warm. Use a neutral-tasting oil such as canola or vegetable oil. Use enough oil to cover the platains. Only use medium heat to fry the plantains, or else the plantains can burn in no time or brown too quickly. You may have to lower the heat depending on the size of your stove burner and pan. 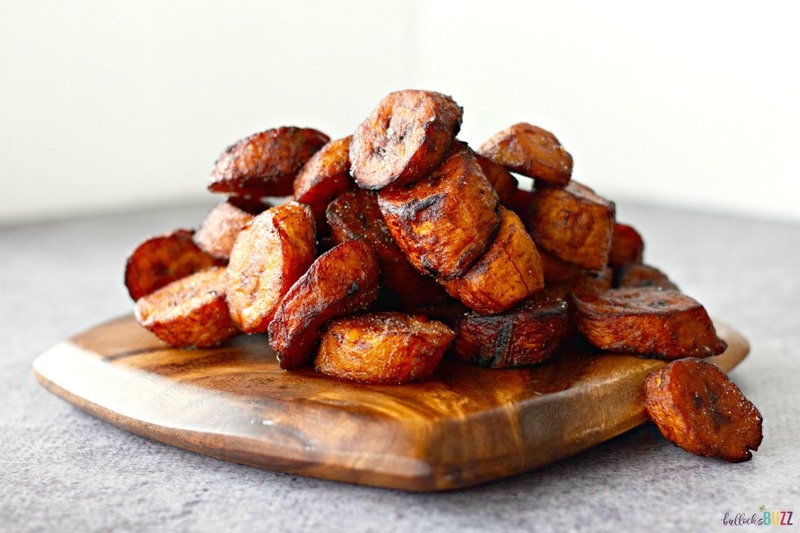 What is your favorite way to cook plantains? Share with us in the comments below!